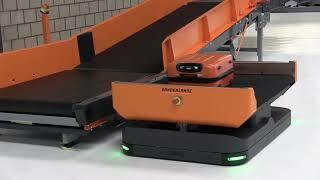 By utilising intelligent autonomous vehicle technology, Vanderlande’s FLEET replaces the need for fixed conveyors and sorting systems. Each individual vehicle carries a single bag and determines the most optimal route through an airport. FLEET also consumes up to 50% less energy compared to traditional baggage handling systems. Its design means that vehicles can be recycled. Real-time track and trace of individual bags can also be facilitated, taking the performance of any baggage operation to the next level. FLEET offers a full end-to-end service solution, which allows airports to benefit from flexible and adaptive capacity for the lifetime of the system. Adding vehicles is easy, offering scalability and flexibility. A vehicle can be given priority and bypass others. FLEET utilises less space, leaving room for future expansion. Resilient design allows for effective operations and maintenance. Uses 50% less energy and vehicles can be recycled. Priority bag and real-time track and trace functionalities. Location of the computers that manage the vehicles. Operators have an overview of the complete system. Regular and out-of-gauge baggage is automatically sorted to multiple destinations. There is no need for manual sortation. Vehicles collect baggage from the self-bag drop units, making the check-in area highly resilient. FLEET creates a balanced flow at the X-ray machine, screening baggage before it goes to make-up sortation.